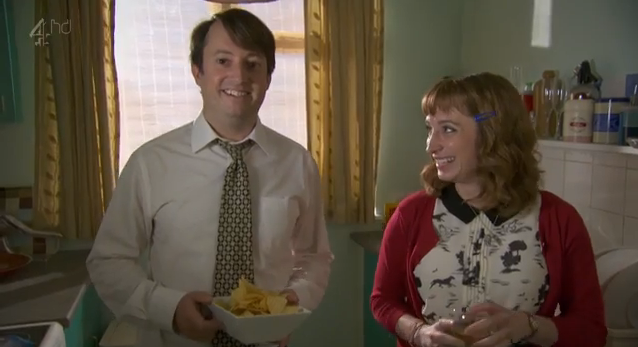 I’m a huge fan of Peep Show. It’s a British comedy that’s been running for eight seasons (so far), and a huge part of its appeal is just how painfully awkward it is. Its two main characters — Mark and Jeremy — aren’t sympathetic at all…and yet they still manage to be extraordinarily relatable. Watching the show is often a deliberately uncomfortable experience, but it’s never cheap; it’s always married to razor-sharp writing and two brilliant performances. The most recent batch of episodes, however, managed to make me uncomfortable in a way that the others hadn’t. That’s because in an installment entitled “Business Secrets of the Pharaohs,” Mark, the put-upon introvert of the show, gets swindled by a self-publishing house. And while the details are pretty different from what I went through (I’ve been interviewed about it by this very site, if you’re interested) the way the episode explores Mark’s mindset, and the way it makes clear to the viewer what Mark himself is too hopeful to acknowledge, reminded me, uncomfortably, of my own foray into the world of self-publishing. So I reached out to Emily and asked if I could put this together, in the hopes that an episode like this (which is on Youtube in its entirety, should you decide to look for it…) might help somebody, at least one person, somewhere, keep a level head in the face of the seductive promises of self-publishing. Hopefully Mark’s embarrassment — and mine — can spare you at least a little of your own. 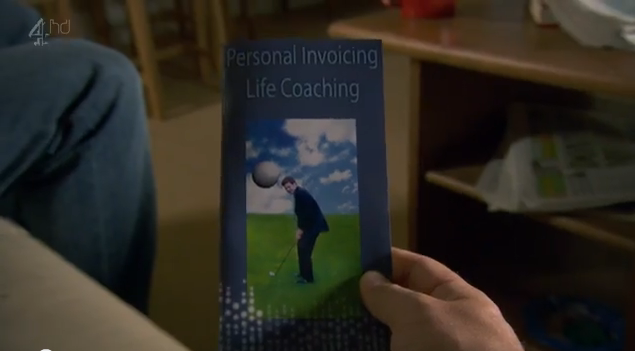 While the episode is about Mark self-publishing his book, Business Secrets of the Pharaohs, his roommate Jeremy has a thematically-similar plot: he’s enrolling in a fly-by-night training program to become a life coach. Interestingly enough, each of the two friends sees exactly what’s wrong with the other’s situation…but neither will admit it about their own. Anyone can produce a nice pamphlet, or a flashy website. Anyone can slap up some customer testimonials. (When’s the last time you’ve checked one to make sure it was genuine? Where would you even begin if you wanted to?) What you have to remember is that pamphlets, business cards and websites are just things. Anyone can appear successful and can entice you to want to work with them, but ultimately that means nothing. Or, rather, that means that the person took the time to mock something up. Genuine or not, that isn’t where your research about the company should end. Look online. Find actual reviews from actual past clients. Ask for copies of books that they’ve published in the past. Any reputable publisher should be happy to show off their work; if they treat your request like it’s ridiculous, take a moment to wonder why that might be. It’s great if the services listed on their website line up very well with what you were hoping to see, but bear in mind that their site exists only to sell to you. It’s no gauge of quality, reliability, or ethics. Dig deeper. You might not like what you see, but that’s better than seeing it too late. 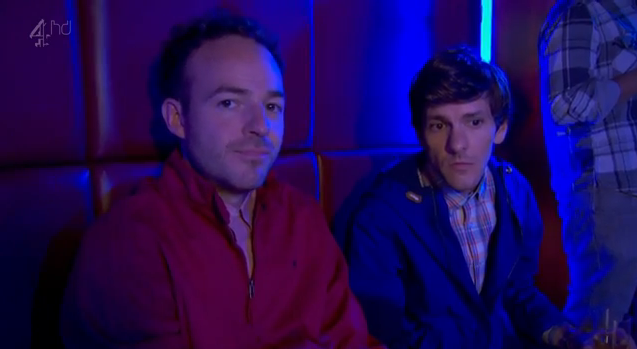 The screengrab above shows the faces of two people who’ve just heard what Mark’s book is about. Do people look like that when you start describing your own work? Then you may have to face a difficult fact: it might not have an audience. It’s easy for a writer to develop an inflated sense of the value of his or her own material. I know, because I am a writer, and everything I produce is fantastic. But you have to be realistic. Mark, by this point, has spent eight seasons trying to interest a publisher in Business Secrets of the Pharaohs. And while it’s always possible that a struggling author just hasn’t found the right match for his material, it’s also possible that it’s the material that’s the problem. Would anyone want to read about your interpretation of the presumed negotiating tactics of a long-dead civilization? Nobody wants to read Mark’s…but he doesn’t want to admit that to himself. At one point he even describes it as “an important work of world literature.” Spoiler: it’s not. And it’s important that you can view your own work through a realistic lens as well. If you can’t find an agent or a publisher for your manuscript, it may be worth looking at the manuscript. It may be worth looking at your query letters, your sample chapters, and anything else you’ve been sending out. The answer isn’t to pay somebody to publish your work…it’s to refine your work so that somebody wants to publish it. Believe me, I know this can be a difficult lesson to learn. I spent years shopping around a manuscript that went nowhere. I tried a few approaches, but ultimately came to accept that even if it was a great book, it wasn’t something that many agents or publishers would take a risk on. I could pay to publish it (there’s always somebody that will be happy to take your money), but instead I decided to work on another project, one that would be more marketable, and serve as less of a risk. If that gets published, I may be able to find some interest in my earlier manuscript. But even if it doesn’t, I feel good about taking a constructive approach to the solution. 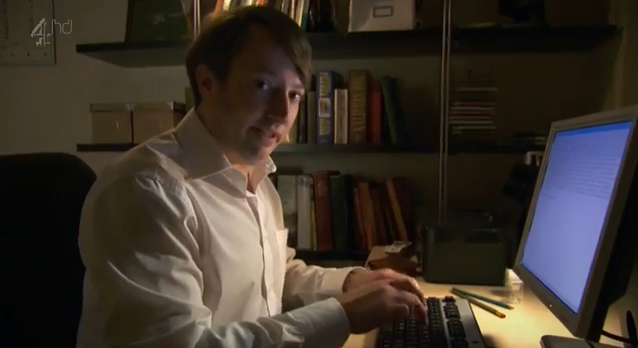 At one point in the episode, Jeremy finds Mark at his computer, typing furiously away, unaware that he’s had caps lock on the entire time. But it’s okay, the friends figure…a publisher would surely correct something like that before going to press. Obviously this is funny for one very obvious reason, which is that your manuscript needs to be in absolutely perfect shape before you start soliciting. There aren’t second chances, and you’d be foolish to assume that a publisher who saw a caps-locked screed land on his desk would give you a chance to fix it up later, after you’ve signed a three-book, twenty-million dollar deal. Then again, Jeremy does have a small point: if they wanted Mark’s book, truly wanted it, wouldn’t they be willing to make at least a few editorial corrections? The answer is yes. Of course they would. Unless they’re a self-publishing company, in which case that’s an add-on service, and you’ll pay for that. Whether it’s editing, formatting, promotion, or even a simple spell-check, self-publishers will charge you for everything they do. And while that may sound like a nice idea for folks who can afford it, it bears repeating that paying for a service isn’t necessarily paying for quality. My experience working with a self-publisher to fix errors in my book was a nightmare. It actually ended up making things worse in the final product. Money well spent, right? If you’re going to self-publish, you need to make sure that you can handle all aspects of the process on your own. Don’t count on them to get things right, because there’s no self-publishing agreement in the world that will force them to make good on unsatisfactory work. The contracts are drawn up to reflect their interests, not yours, and they have nothing to lose if your book fails; they’ve already been paid. When nobody buys your book, you’re the one who will feel foolish; not them. You need to do everything on your own. It’s not enough to be a great writer, or even to be an impeccably careful writer. You’ll also need to promote the book (assuming its final form is even something you’d want to promote). Can you do that? Because if you can’t, self-publishing might not be for you. You can always pay an exorbitant price for a Promotion Plan…which is usually a pack of simple fliers and a listing in a proprietary magazine no human being will ever read…but unless you’re keen on doing any and all legwork for the life of your book, you’d be better served by a traditional publishing house, which does have an interest in your success. And that’s where you should be looking. It won’t be an easy road…but it’s the only road. It’s very easy to get swept away by the allure of being a published author. It’s what we all want, and it’s nothing to be ashamed of. Unfortunately that’s exactly what self-publishers prey upon. Poor Mark lacks confidence, he can’t get a publisher interested, and he feels as though he’s a failure. So when British London accepts his book, he’s ecstatic. Why wouldn’t he be? His dream is coming true. Or, at least, he wants to believe that his dream is coming true. And so did I. And so would you. But we can’t be blind to reality. It’s important to stay grounded, because if we don’t, we’ll get swept away. Remember that self-publishing houses are not staffed by agents and editors…they’re staffed by sales people. They will find out what you want, convince you that self-publishing is the way to get those things, and do anything they can in order to obtain a sum of money. That is their job. Throughout the episode Mark fails to notice red flags. Not because he’s a fool — and you wouldn’t be a fool for being taken in, either; these are very good sales people — but because he doesn’t want to admit that this might be anything less than he wants it to be. 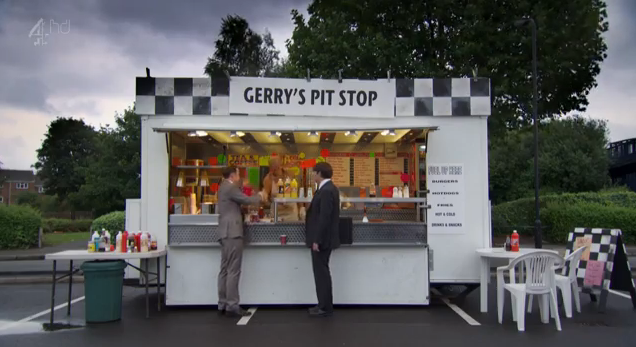 When the representative from British London asks to meet him at a food truck on the side of a highway, it doesn’t even register with Mark. He even looks at the table of condiments and thinks, “This must be the greatest quantity of squeezable mustard ever present at a literary lunch.” He’s thinking it in awe…but he should be thinking it in fear! He sees a red flag, but interprets it as a good sign. 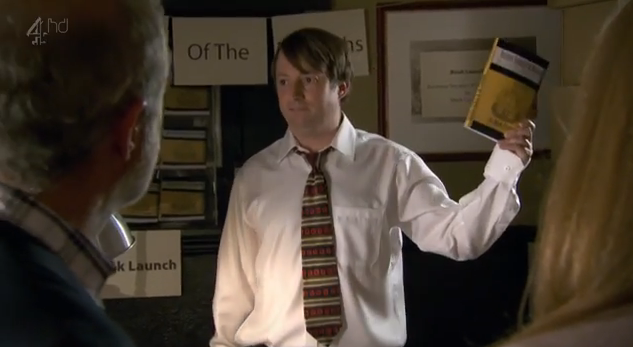 As Mark discusses his book with his representative, it’s clear that the man hasn’t read Business Secrets of the Pharaohs. It’s equally clear that he doesn’t care about its quality…though Mark interprets this, again, as a compliment, since he has “no notes at all” on the material. If a publisher has “no notes” on your material…forgive me for saying this…that’s not a reflection on how miraculously brilliant and utterly perfect your first-draft was; that’s a reflection of how little they care about the quality of the pieces they publish. Does that sound like a compliment to you? It happens. You were seduced. Part of you knew better, but you were able to keep that part quiet long enough to complete the PayPal transaction. And now you hold a copy of your book. Your book! Only your book is full of errors. The text disappears into the binding. Your name is spelled incorrectly on the cover. You’re heart-broken. It’s too late to go back. You’ve humiliated yourself in front of everybody you’ve been bragging to about the publication…and you’re not getting your money back. This is what happens to Mark, and it’s not any kind of exaggeration at all. Self-published material is often shoddy. Somebody makes you big promises, but what you hold in your hands is a physical manifestation of artistic disappointment. Here’s what I want to tell you about that: it’s okay. You’re not an idiot. You were taken. And that’s okay. Why do I say it’s okay? Because if you don’t believe it’s okay, you’ll try to convince yourself otherwise. You’ll convince yourself that next time it will go better. In short, you’ll do it all over again. This is why you need admit you have made a mistake. Mark gets so swept up in the excitement of his impending publication that he spends more time deciding what kind of nuts to serve at his self-financed launch party than he does thinking about whether or not he’s working with a reputable publishing house. But when the book arrives, with that misspelt name on the cover and the text printed in an unreadable format, he owns his mistake. He lets everybody at his own launch party know that the book is a disaster, a tragedy, and proof of a broken promise. His money isn’t coming back, and neither is his pride, but at least he won’t lose more money and pride by trying again. You’re a human being. You have desires, needs, and goals. If you’ve lived long enough to consider yourself a writer, then you’ve lived long enough to know that there are those who will exploit your ambitions for their own personal gain. In fact, there’s an entire industry out there designed to do exactly that. Watching “Business Secrets of the Pharaohs” was something I had to do through laced fingers. Mark’s an intelligent guy who just wants to believe that the universe has offered him a break. I remember that feeling well. It’s a nice thought…but it’s no substitute for reality. Be careful. Be honest with yourself. And, for heaven’s sake, keep your wallet in your pocket. You’ll thank me later.